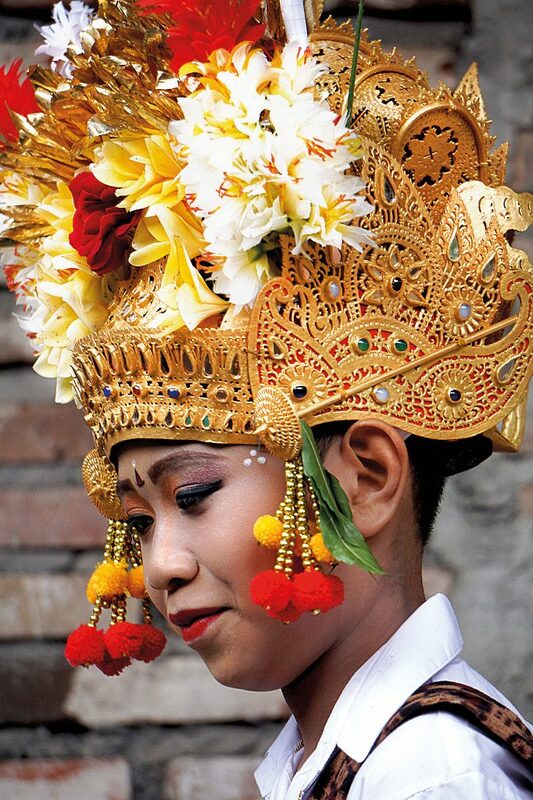 Every year the Bali Aga (original Balinese) villages around Karangasem celebrate the coming of age of their young folk with a procession of rites and rituals. 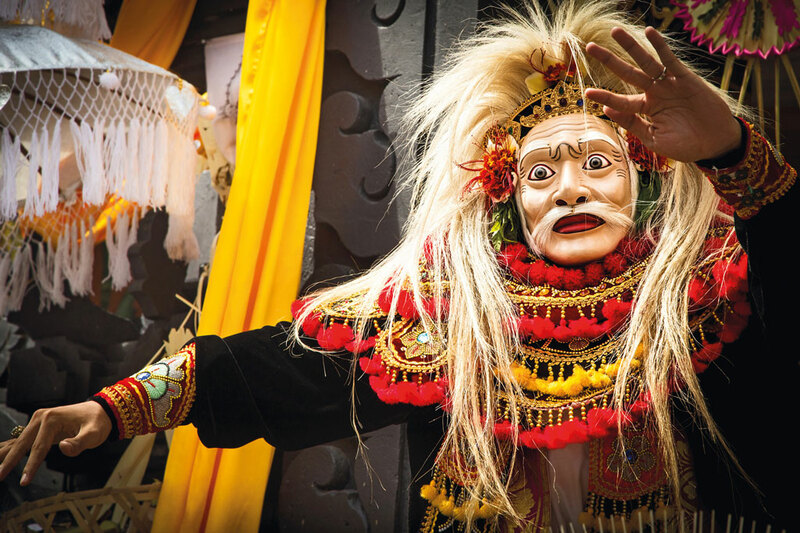 Part of the celebration is the famed Parang Pandan – fights with spiny pandanus leaves designed to draw blood from their opponents to spill on the ground and thus appease the attendant spirits. While it is a serious occasion, it is far from solemn and for any roving photographer, it is a visual delight. Everything is so cute. The dear boys dressed up for the day often could be mistaken for girls. It is a total eyestopper the first time you encounter them. Everyone looks gorgeous and everyone is happy – it is a celebration after all. While the pandan fights are quite well known amongst aficionados, the advent of the Dahas and Tarunas is much less so. On this day, it was the turn of the boys, the Daha, to go through their paces. The days start early with prayer and breakfast before the dressing up begins. Each boy to be admitted to the community is dressed and made up rather like a girl with full makeup. Is it to bid farewell to their feminine side before becoming a man or before being accepted as a male into the community I ask myself. As with many of the rituals they are really bathed in mystery and no one seems too sure of the origins or even the meanings. Dressing takes a while and then around 2pm, the newly created Dahas make their way to the central square, on this day, in the full rain – a bit of a dampener, although the weather didn’t seem to affect the spirits of anyone much. It was just one more thing to accept. Today is just one part of a celebration that lasts for two to three weeks each year, with different ceremonies happening each day. Some are arcane and obscure while others like the pandan fighting are proven crowd pleasers, to such an extent that stages are erected to give the crowds (and the crowds of photographers) a better view. Dauh Tukad is a sister village to Tenganan, and although not quite as traditional looking, it follows the same lunar cycles and cycles of life. 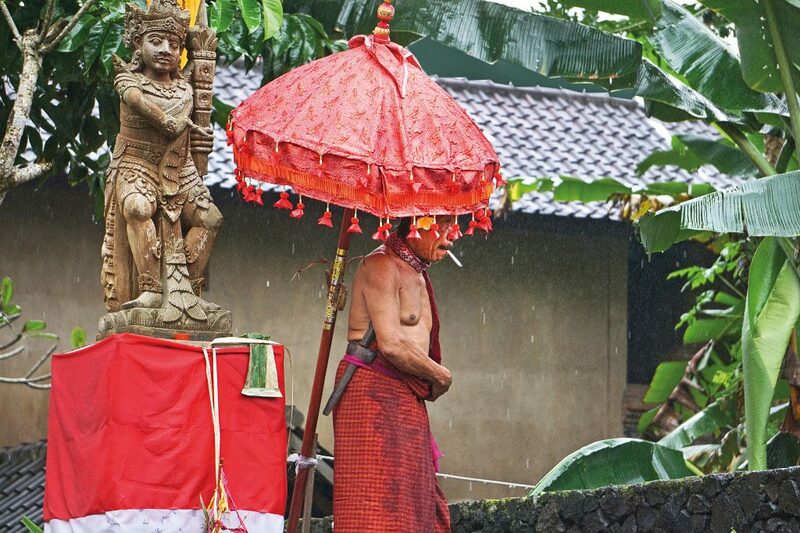 Both the villages are tucked away in the hills behind Candidasa on Bali’s east coast. 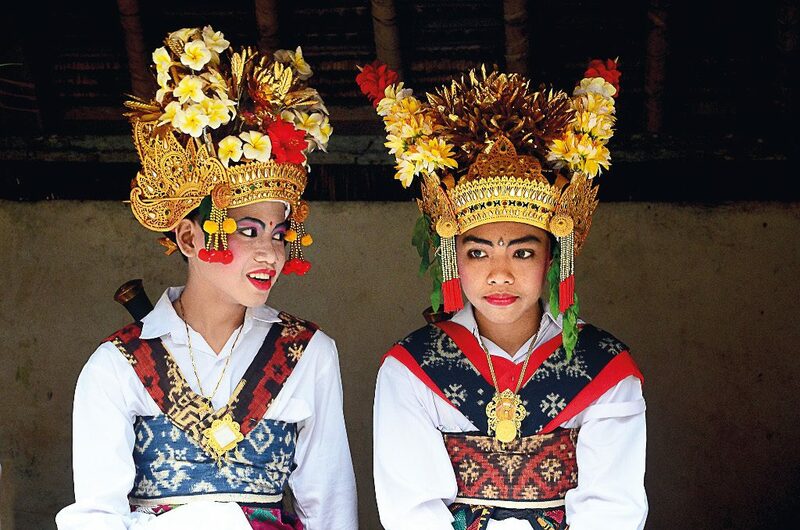 Both villages use the sacred gerinsing cloth – the double ikat that is famed throughout the world by serious collectors. (Only three places can make double ikat – Tenganan in east Bali, an island off Japan and India’s Gujerat – from where the techniques and some of the motifs are derived). 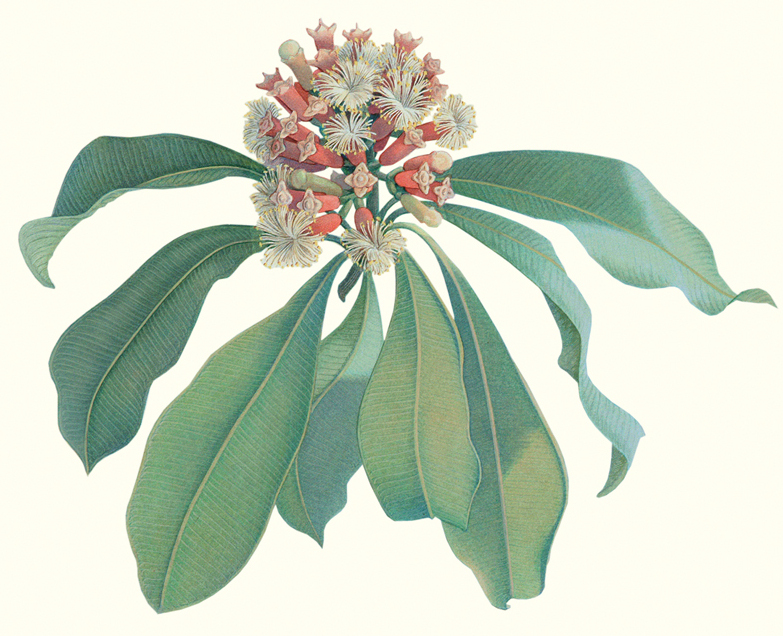 This beautiful and difficult to produce textile is very expensive and reputed to have magical protective properties. 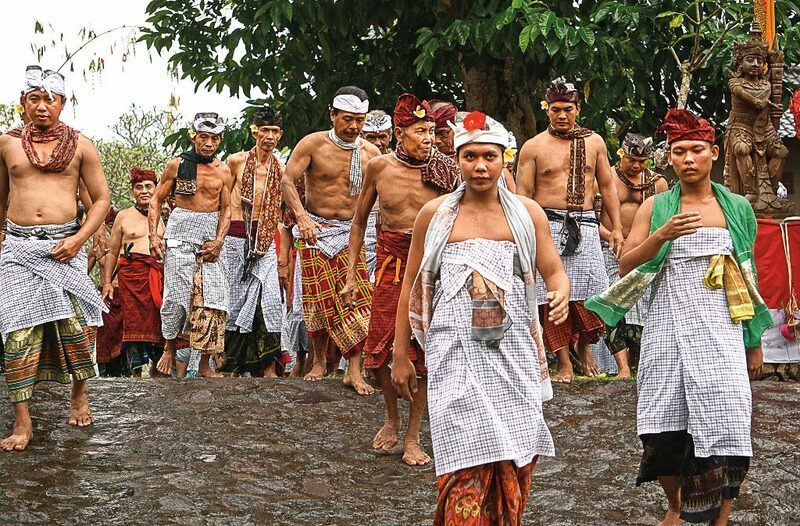 It is believed to keep evil influences out of the village and also protect the wearers during rites of passage ceremonies such as this one. As the Tarana are admitted to the community association, they are swathed in this precious fabric, and will also wear a sacred kris that has been in the family for centuries. 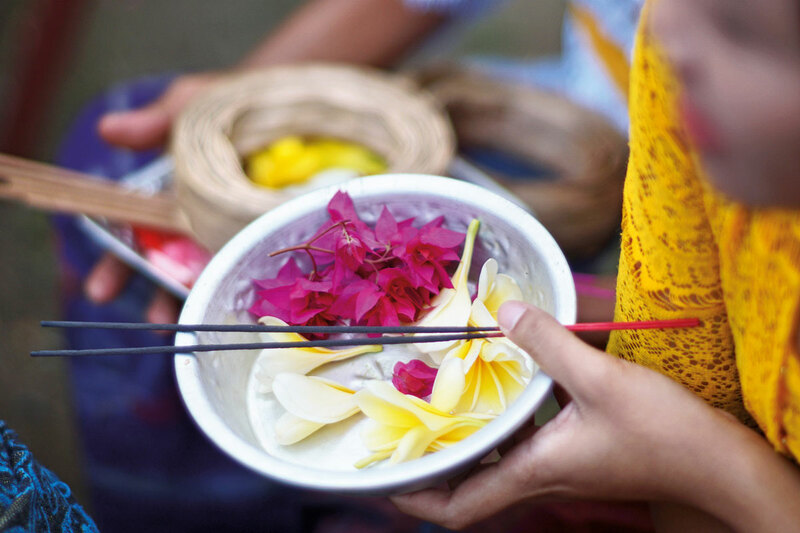 Another part of the ceremony will include the tooth filing ritual that every Balinese must undergo to ensure his animal instincts are erased and his temper even. For textile lovers, as well as photographers, and the merely curious, it is a ceremony not to be missed.